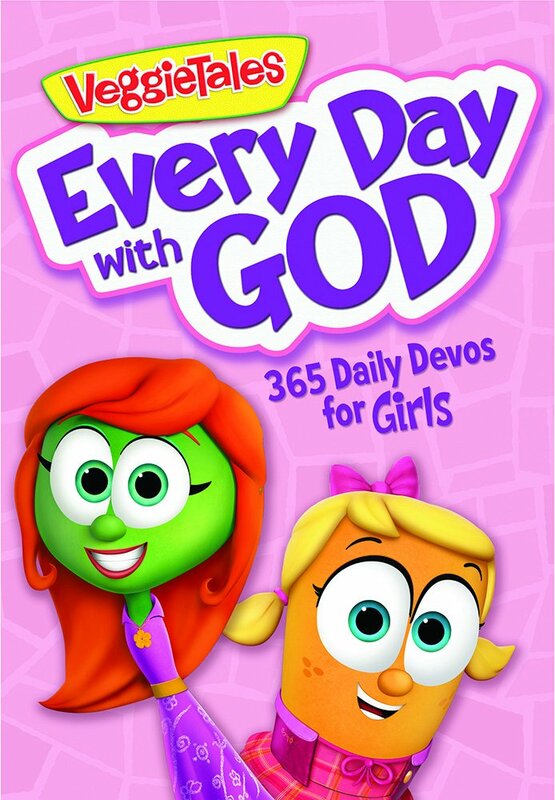 Age-appropriate devotionals are a wonderful way to share the word of God with children. Our latest devotional read is based off of the #1 children’s faith-based brand, VeggieTales. With more than 13 million books and 70 million videos sold, you know they're doing something right! My son just loves them, and I couldn't be any happier since they are a Christian brand that offers children important lessons on values and virtues. Every Day with God is the latest 365-day devotional from VeggieTales. The updated content and art offer the perfect opportunity for parent and child to share time together each day. Each entry includes a Bible verse, short devotion, Thought of the Day, and prayer. The content will help children learn more about God and develop a daily practice to keep Him close in their lives. The book is perfect for bedtime reading, family devotion time, or as a fresh way to start each day! 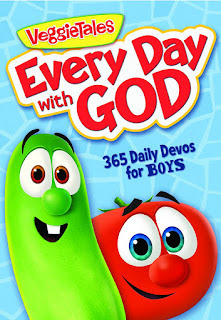 VeggiesTales Every Day with God is a fantastic devotional that covers an entire year of child-friendly teachings. There are actually two versions of this devotional, one for boys and one for girls. We opted for the boy version of course, and we just love it! My son gets a kick out of all the illustrations of those delightful fruit and veggie characters. Although this devotional is labeled for children four through seven, there is a bit of flexibility where it would also be fitting for an older child and even a younger one. My son is a toddler, and he sits there listening attentively as I read a devotion to him, sometimes many in one sitting. While this devotional covers 365 days, there is leeway to skip around or read multiple in one day since each devotion doesn't have a specific date (although they do list "Day 1" "Day 2" so on and so forth). This is good for us, since my son is still young and I can read it to him like a story while still getting in his daily dose of God's word. Of course, in a couple of years he is going to be studying this on his own and will be able to establish a more scheduled routine of each reading. The physical book is a soft cover that's easy to flip through. The inside contents are printed on high quality gloss paper. This is nice, because it gives the illustrations that extra pop in color. The first page of the book offers an area for presenting it as a gift. I also really appreciate the additional section in the back of the book, which includes a special selection of scripture verses that parents can help their children memorize. I am thrilled that my son now has his very own VeggieTales devotional. As he gets older, he's starting to like them more and more, so this could be the happy beginning of a library full of those beloved VeggieTale characters. Each day of this devotional offers a special message of encouragement to children as they learn about the Lord's love and wisdom. I'm also happy to be offering a giveaway opportunity for Our Everyday Harvest readers. 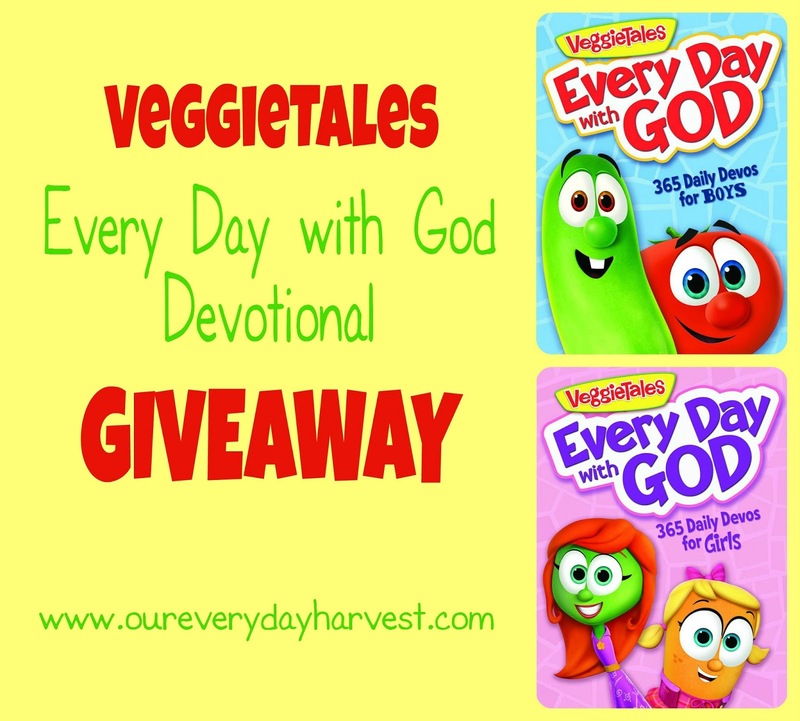 One winner will receive a copy of the new VeggieTales Every Day with God devotional in their choice of the boy or girl version. Use of Endorsements and Testimonials in Advertising”): Many thanks to Propeller Consulting, LLC for providing this prize for the giveaway. Choice of winners and opinions are 100% my own and NOT influenced by monetary compensation. I did receive a sample of the product in exchange for this review and post. Only one entrant per mailing address, per giveaway. If you have won a prize from our sponsor Propeller / FlyBy Promotions in the last 30 days, you are not eligible to win. Or if you have won the same prize on another blog, you are not eligible to win it again. Winner is subject to eligibility verification.